Pictured are Exalted Ruler Bob Marchi and PER Walton Brown, representing the Gallipolis Elks, presenting cerebral palsy grant checks to Suzanne Eachus, principal, Guiding Hand School, Gallia County Board of Developmental Disabilities and Kay Davis, superintendent, Meigs County Board of Developmental Disabilities. Exalted Ruler Bob Marchi and PER Walton Brown recently presented cerebral palsy grant checks to Suzanne Eachus, principal, Guiding Hand School, Gallia County Board of Developmental Disabilities and Kay Davis, superintendent, Meigs County Board of Developmental Disabilities. 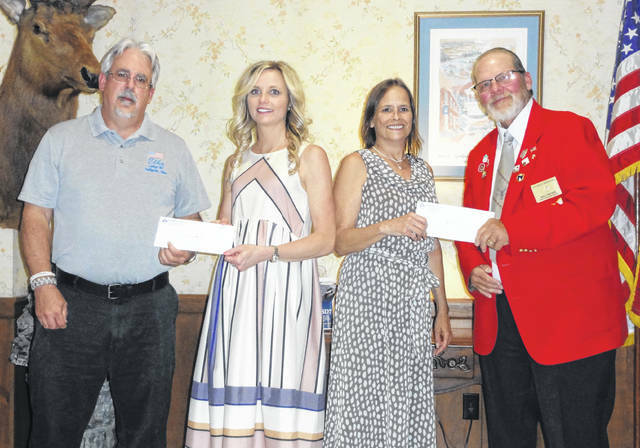 The grants, which totaled $13,514, were provided by the Ohio Elks Cerebral Palsy Fund Board which is administered by the Ohio Elks Association. Meigs County DD board received a check for $400 to cover the expenses of one of their students to attend summer camp while Guiding Hand received $800 to cover the expenses of two students. Eachus is going to use their grant money to purchase a giant, interactive sensory light board for the students while Davis will purchase musical playground pieces. This year, the Ohio Elks Cerebral Palsy Fund Board provided $215,176 to cerebral palsy treatment centers throughout Ohio. https://www.mydailytribune.com/wp-content/uploads/sites/42/2018/06/web1_0603.Elks_.jpgPictured are Exalted Ruler Bob Marchi and PER Walton Brown, representing the Gallipolis Elks, presenting cerebral palsy grant checks to Suzanne Eachus, principal, Guiding Hand School, Gallia County Board of Developmental Disabilities and Kay Davis, superintendent, Meigs County Board of Developmental Disabilities.